Life is beautiful - Enjoy it to the fullest. :-) :-) Have a nice day! : A bike trip to remember . . .
A bike trip to remember . . . Hurray!!! I have done it!!! Now that is called a long bike trip which we were yearning for quite a long time. So, as planned, we started our journey on Friday – 21st February at 4:30am to avoid traffic and reach early. It was still dark outside and the road was mostly empty apart from a few occasional trucks. We started on the Pune-Sholapur highway and soon reached 75-80kmph on the city roads where we just dream of crossing 60. After crossing the city limits and the 1st Toll-plaza, we cruised on full throttle with 95-105kmph with occasional 110+ speed and easily reached Sholapur (260km) in one stretch at 7:30am. Even the weather was pleasant during the ride - seemed like everything was in our favour. We took our second break after crossing the Karnataka border, had tea and gave rest to our aching bodies. It took us nearly 3 hours to cross that small patch in Karnataka. We were just hoping that Andhra didn’t have any more surprises for us. Thankfully, the roads were good with less traffic and we drove freely. The time was 2 pm and we were almost on the city limits of Hyderabad and were feeling hungry. We stopped at a dhaba and thought of trying something different and ‘tada’ – we had Jowar roti. I think it would be my first and last triumph with Jowar roti. When we started after lunch, I was driving and Gaurav was navigating with the help of his Nexus. After going parallel to the Hitech-city expressway endlessly for quite a long and frustrating time, we reached Wipro circle. Next, we crossed Microsoft, Infosys and were standing at Gachibowli circle which seemed like a familiar territory. Pretty soon, we were outside café Nandini at Madhopur without any difficulty and by 4pm, we were lying down on cozy beds which felt like heaven. After relaxing for 2 hours, we thought to explore the city on foot as both of us were in no mood of biking. So, we started right away and Gaurav suggested discovering the ‘Durgam Cheruvu secret lake’. Then started our series of calls to friends in Hyderabad – some we were able to talk, some we could not. By the time we got to the lake, it was already dark and the lake appeared to be totally deserted and smelly. Google maps showed we were near Inorbit mall and we didn’t have anywhere else to go at this time anyways. Next we went to Delhi-39 in Hitech City with the Hyderabadites(old Puneites) for dinner and made plans of visiting Ramoji film city, NTR Garden, etc for the next day. I thought it was end of a long day but Gaurav had some more plans. We went to meet some of his college friends at Infosys. With the dinner, college chats, simultaneous messaging and walking in that awesome weather in night, time just flew by and before we could realize, it was 3am – time to retire. Next day, we woke up to rush to watch ‘Highway’. A day ago, we had watched it live and today, we were going to a mall for the movie. Seems like a deviation from yesterday’s plan of visiting Ramoji. Next, we enjoyed bike races and bowling at Inorbit mall, followed with lunch (and it was 5pm already) which felt like Hyderabadites are not interested in showing us anywhere in Hyderabad. Then we went to NTR Garden (just crossed it from outside), followed by Lumbini park (we just had pani-puris outside it, didn’t go inside this too :D) and finally reached Birla Temple (and we didn’t go inside the main temple too :P). We just sat outside the temple enjoying the night view of the dazzling necklace road around the Hussain Sagar Lake from the top. By the time we returned to Hitech City, it was already late and we called it a day. 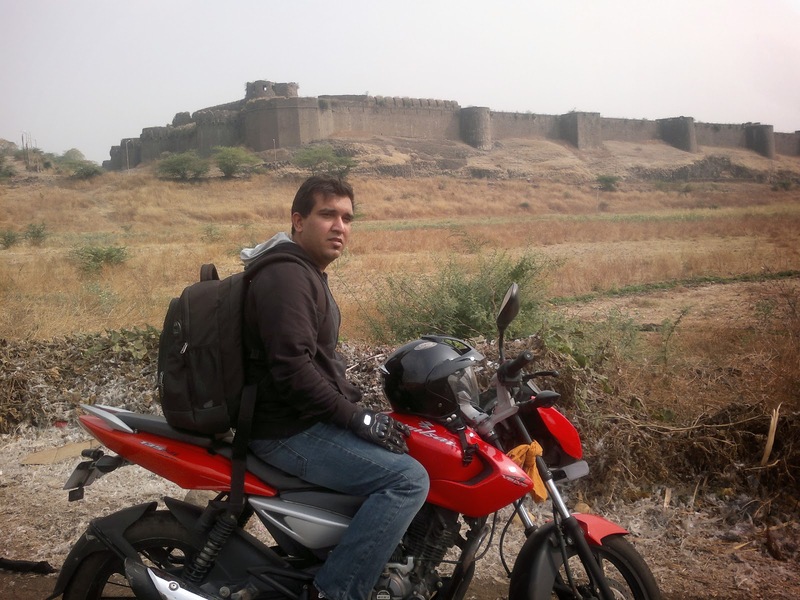 It was our 3rd day in Hyderabad and we had to return back to Pune that day. Gaurav wished to have Hyderabadi biryani before going back and we went to Paradise restaurant for the same. It might be famous for its biryani, but at least that day, it was not worth anything. 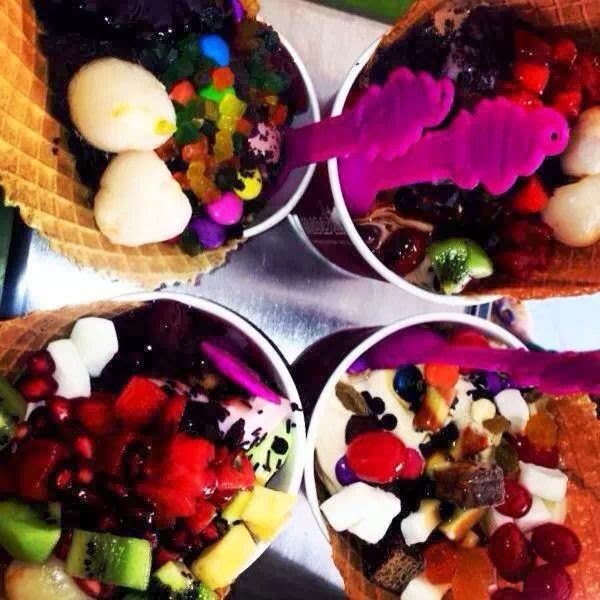 Next, we went to Menchies for having frozen yogurt and that was the treat to this trip. Making our own combination of yogurts with our own choice of toppings was fun and was an equally yummy and delightful experience. This marked the end of our stay at Hyderabad and it was time to leave for Pune as we wished to cross the bad patch of Karnataka before dusk. The time was 4pm and my bike was refusing to start. After numerous kicks, when it finally started, Gaurav feared whether it will survive till Pune or not but I had confidence on it. After this short disturbance, we bid farewell to Hyderabad and started our journey from Hitech City. By the time we reached Karnataka, it was starting to be dark and our ride had started becoming bumpy again. Then, I noticed that front-left indicator was hanging down from the bike. At first I thought someone had broken it in Hyderabad but we found that its screw had become loose and fallen-off. We fixed it temporarily with a twig and carried on with our journey. It had become dark and the headlights of the trucks coming from the other side were making it too difficult to drive on that pit-full road. Gaurav took charge and drove carefully and we were almost near Sholapur by 9pm. We took a long break, had our dinner and started at 10:30pm from there. Roads were better now but the pits had made the condition of bike weak with us. The handle was a little loose and we joked whether it will come out in our hands. 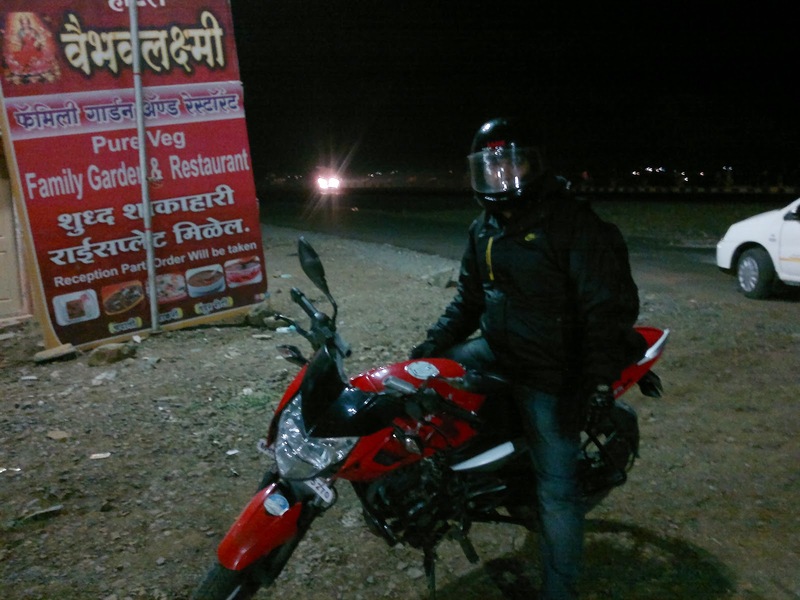 Even after reaching Sholapur-Pune highway, we went at normal speed to avoid any further load on the bike. We took 2 more tea-breaks on the way and made it smooth and safe to Hadapsar. Just before reaching Hadapsar bus-stand, Gaurav told that something hit his legs and fell. We stopped and saw that the side panel of the bike was missing. I went back to fetch it and just before my eyes, 3 trucks crossed over it. I had lost hope but on picking it, I found that it was still in good condition with just a few scratches (Jai ho Bajaj walon ki). Finally, we reached Magarpatta at 4am, thanked the bike for delivering us back safely and that’s how we ended our great bike trip with loads of memories. P.S. – Well, I had promised someone that I would come to Hyderabad before March and here I was, and little did the person imagine that I would come ‘Dhoom’ style. There was a time when this trip was almost cancelled on Thursday night and still I was thinking of making it, even alone. Gaurav, after hearing that I would be going alone anyway, was ready to accompany me. We slept just 1-2 hours that night and were still undecided to take 2 bikes or 1. Finally, just before our start, Gaurav told me to go on my bike which was a great decision. On the lighter side, we did a rough calculation on the way that if he had brought his bike, the amount of fuel consumption would have made the air-travel cheap. At the end, I just want to add that Gaurav was the inspiration in the trip. Had he been not there with me, I don’t think I would have been able to make it. Thanks a lot Gaurav for making this happen.